La Bague Au Roi has been the apple of trainer Warren Greatrex's eye for some time - and lined up contest with a perfect record over fences to date. She was always going to be tested to the limit though, in what looked the deepest renewal of the three-mile showpiece for many a year. Richard Johnson was happy to take a lead for two-thirds of the contest, as Red Indian and Bags Groove set the pace, until the latter disappointingly dropped away on the second circuit. La Bague Au Roi jumped herself to the front a long way from home, gaining lengths at her fences and putting the others under pressure, including the favourite Santini, who was caught flat-footed turning in. 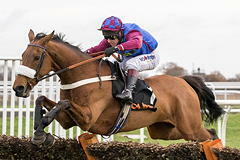 It was the Paul Nicholls-trained Topofthegame who loomed up as the big threat and he looked sure to win when Henry Cobden kicked him into a lead approaching the second-last, but he met the fence wrong. That gave La Bague Au Roi the advantage again and like a terrier she would not be denied, flying the last and keeping on for a length-and-a-half victory. The Feltham Novices Chase is one of the big key races on King George Chase day each Boxing Day and it is turning into one of the most important races of the season. The Feltham is a key race for Novice chasers over three miles and we had some of the very best horses take the win before going onto bigger and better things. Perhaps the most famous recent winner of the Feltham is Long Run who of course since gone onto win the King George Chase itself and the Gold Cup at Cheltenham.